Home / Archive by category "latest"
Afterschool advocates meet with a Congressional staffer on Capitol Hill. On April 16, 2015, after three days of markups, the Senate Committee on Health, Education, Labor and Pensions (HELP) voted to reinstate funding for 21st Century Community Learning Centers (CCLC) in the Elementary and Secondary Education Act (ESEA) Reauthorization. The Committee’s bipartisan vote to preserve 21st CCLC, the primary source of federal funding for afterschool programs, will not only improve existing opportunities for the 1.6 million children currently enrolled in afterschool programs, but will also help modernize the initiative and expand access to more quality programs throughout the United States. Jodi Grant, Executive Director of Afterschool Alliance, applauded the vote as “a huge victory for the nation’s children and families,” preserving essential opportunities that have a proven track record of success. 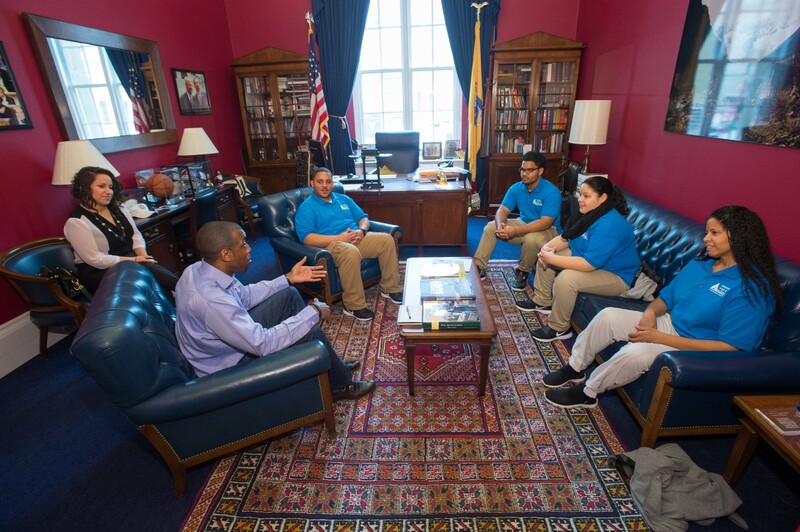 The Committee’s vote can be credited, in part, to the dedicated afterschool advocates who lobbied Congress and made their message heard from coast to coast. From sending over 4,000 emails to Members of Congress to eliciting help from notable celebrities like Arnold Schwarzenegger, afterschool advocates were persistent and effective in their efforts to block ESEA revisions that threatened to put 21st CCLC programs at risk. Schrayer & Associates has helped to support these incredible programs for nearly 15 years, designing the first ever Afterschool for All Challenge in 2002. Since then, thousands of activists from all 50 states have come to Capitol Hill to rally support for this remarkable cause. This year, the Schrayer team helped arrange more than 250 Congressional meetings for over 400 afterschool advocates. In addition to the ESEA victory last week, the 2015 Challenge was successful in adding at least eleven new co-sponsors to the Supporting Afterschool STEM Act and five new co-sponsors to the Afterschool for America’s Children Act. These victories reinforce that citizen advocacy can go a long way and underline the crucial role that effective citizen organizing plays in government policies and decision-making.